Summer has officially hit Southern California this weekend with temperatures in the 80s and promising to rise. It seemed a perfect time to pull out an old Italian favorite – granita! Somewhere between a sorbet and a snow cone, depending on the flavor, this dessert can be decadent and filling and at the same time refreshing and light. Probably one of the most basic of desserts as far as preparation is concerned, it is super easy to make, looks like you spent hours preparing and is sure to be a crowd pleaser. It is a perfect dessert for when you want something lighter and less fattening than cake, cookies or ice cream. 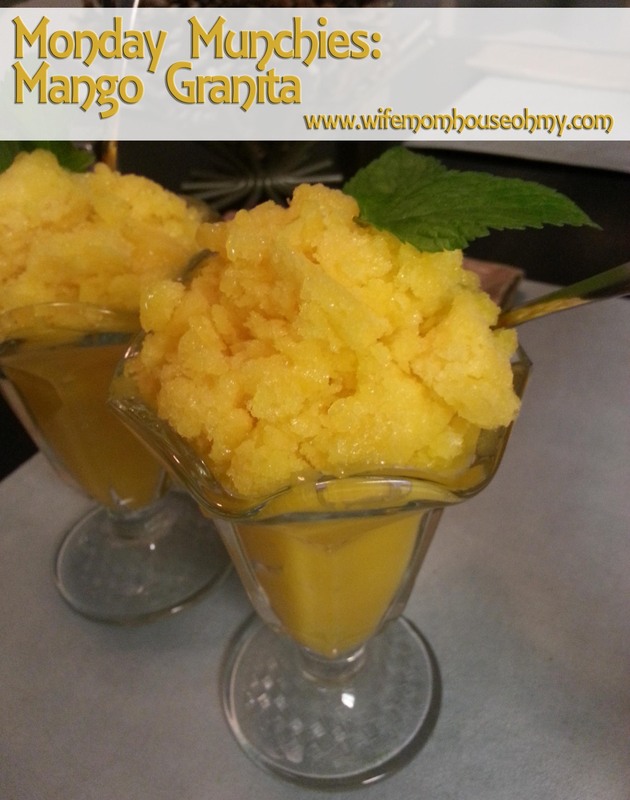 The recipe below is for mango granita but you don’t have to stop at mango granita. You can use just about any fruit you would like from watermelon to strawberries to oranges. Plus, you can even go savory. A mint cucumber granita can be a perfect finish to a relaxing mommy spa day for you and your friends. Even better if you spike it with a teaspoon or two of spirits (too much and it won’t freeze). You can also go traditional with an almond granita. The recipe is basically the same for each type. 1. Make a simple syrup by heating 1 cup of water and 3/4 cup of sugar on the stove. Stir and heat until all the sugar has dissolved. Set aside to cool slightly. 2. In a blender puree the mango and lime juice. Add the simple sugar and blend until smooth. Pour it into a 9 x 13 glass pan and place into the freezer. 3. Every 25 minutes, using a fork scrape crystalized sides into the middle of the pan, moving the non-frozen parts to the outside. Total freezing should take about 1 to 1 1/2 hours. 4. Once completely frozen, shave the granita with a fork to create shaved ice. Serve in tumbler, ice cream glass or martini glass and garnish with mint leaves. Serve immediately. Remaining portions can be kept for about a day.